The success of the European Championship, now in its third season, stole some of the limelight from the British championships in 1977 and the continuing divide between the BP-sponsored BARC title and the Vandervell-sponsored BRDC title cannot have helped. Stephen South started the season in dominant form in the March 763 he had raced in 1976 and led both championships into July. After wrecking the 763 in an accident with Derek Daly, he moved over to a March 773 and the BP series turned into a three-way fight with Daly and Swede Eje Elgh, both in Chevron B38s. Daly led into the final round and clinched the title by winning after his rivals dropped out. South's consolation was the Vandervell title. Both drivers moved into F2 for 1978 but only Daly was able to secure a proper budget. March remained narrowly the most numerous car on the grid, with 190 starters, from Chevron with 175 and Ralt with 148, but there was a significant shift to the Ralt RT1 during the season, with Derek Warwick, Nelson Piquet and Elio de Angelis all swapping to the Woking marque. 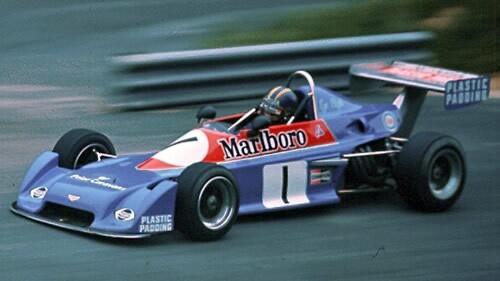 Chevron won ten races, March nine and Ralt four. The only other constructors to feature in England were Lola, whose T570 was hauled into fourth place at one race, and Anglia Cars' new Argo JM1 which impressed with a handful of minor placings. This series ran over 17 rounds and used a 9-6-4-3-2-1 points system with an extra point awarded for fastest lap. Points tables from Autocourse 1977/78 p234. For some reason, Autocourse omitted Geoff Brabham from the points table, despite him having won at Donington in June, finished second at Donington in October and having taken (or shared) fastest lap at those two races as well as at Thruxton in March, at Thruxton in June and at Donington in July. This series ran over seven rounds and used a 20-15-12-10-8 points system with two points for fastest lap. Points tables from Autocourse 1977/78 p233. The 1977 results have been compiled by Chris Townsend using the main British magazines Autosport and Motoring News, the French Auto Hebdo and Autosprint in Italy. The BARC Archive has also been immensely helpful. The top six or top ten finishers are generally known but full results are still needed for many of the races. Most qualifying results are known but copies of practice or grid sheets would be greatly appreciated. March, Chevron and Ralt chassis records allow a lot of the cars of this period to be identified and it was common for Autosport, Motoring News and Autosprint race reports to mention former owners of second-hand cars. Chassis plate observations by Adam Ferrington and Wolfgang Neumayer of the website www.formel3guide.de have been invaluable. Autosport adverts as well as its 'Pit & Paddock' and 'Sports Extra' sections add further information on car movements. Modus records may exist somewhere and a copy, even a partial one, would help considerably.